There are two main elements in the Harvard citation style: in-text citations in your paper and the reference list at the end of your paper. Click on the tabs in the box below to see examples of in-text citations and examples of reference list entries. For more information on how to reference, including how to avoid plagiarism and academic misconduct, see the Student Services STUDYSmarter referencing guides. Note that there is no punctuation between the author's surname and the year of publication. If you quote directly from an author or paraphrase a specific idea or piece of information from a source, you need to include the page number of the quote or passage in your in-text citation. It has been asserted that the primary "role of management is to combine, allocate and utilise the organisation's resources in a way that will assist the organisation to achieve its objectives" (Bray et. al. 2014, p. 129). What if I want to cite some information that someone else has cited? Sue reads an article by Alex Byrne in the Australian Library Journal in which he cites or refers to statements made by Tim O'Reilly on his website at http://www.oreillynet.com/pub/a/oreilly/tim/news/2005/09/30/what-is-web-20.html Sue wants to refer to O'Reilly's statement in her assignment. Byrne, A 2008, 'Web 2.0 strategies in libraries and information services', The Australian Library Journal, vol. 57 no. 4, pp. 365-376. If any similar qualitative research is to be undertaken in the future, then stringent controls should be put in place to ensure such statistical anomalies do not occur through lack of methodological rigor, particularly through corruption of data inadequately stored and processes (Mullane 2006, p. 66). Reference list entries contain all the information that someone needs to follow up your source. Reference lists in Harvard are arranged alphabetically by first author. 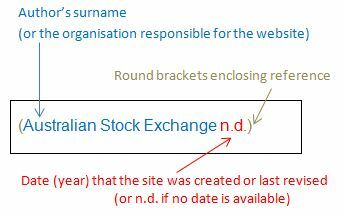 full stops between the: pages and database name, database name and date viewed online, and at the end of the reference. The article title should be enclosed in 'single quotation marks' and should be in sentence case (only capitalise proper nouns). The journal title should be in italics and every word should be capitalised (except for words like the, an, a, and etc). The date viewed online is the date that you viewed the article online - in other words, the date that you found the article in the online database, or the date that you last looked at the article online (not the date that you looked at the PDF you downloaded). Note that if the author of the web document is a sub-body or subset of a larger organisation, you should include the name of the larger organisation after the title of the web document (as per the above example).